Carpet patches are a type of carpet repair that can be done to remove an unsightly area of damaged carpet in a room. See before and after example below. 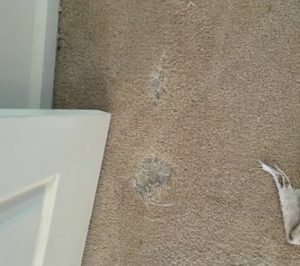 Types of carpet damage that would qualify for a patch are, but not limited to: carpet burn, bleach spots that can’t be spot dyed successfully, permanent stains, and an area of pet damage. 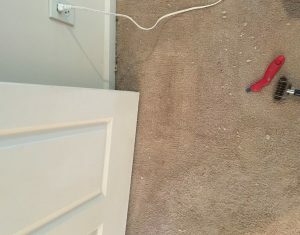 The process of a patch involves cutting out the section of damaged carpet and replacing it with a section of carpet from a closet. It is helpful and more cost effective if a remnant of carpet is provided. The new section of carpet must be the same dye lot and run as the carpet in the room, otherwise it will not match. Contact us today to repair your carpet the right way – The Magic Way!